This raid on the Opel motor factory at Russelsheim was completed in ten minutes, and shut down the forge and gearbox assembly departments for several weeks. Alldridge’s plane collided with another Lancaster just past the target and crashed. All of the crew survived, and were taken prisoner. The remaining planes from 115 Squadron landed at other bases due to the poor weather at Witchford. Johnston’s round trip time of almost 10 hours was his longest yet on a mission. What a trip! But before I go into it, I’ll give the local news. Postings finally came through for PFF but Alldridge didn’t want to go – too near end of tour – and I felt the same way, so Berkeley went I believe. Flew at 10,000 feet until six degrees east then climbed to 19,000 and bombed at that height. After target lost height at 240 mph and 1,500 feet per minute to 6,000 feet. Flew to south of Paris at that height then climbed to 12,000 to reach home. The repeater of the DR was U/S from take-off so flew on P4 to French coast. Did a dogleg and when I straightened out the thing was working so flew on it until about 100 miles from target when it went again along with Nav’s so it was exclusively P4 from then on. Port gen was U/S from take-off also. Went between Mannheim and Karlsruhe on the way in and it was pretty lively – as was the target. 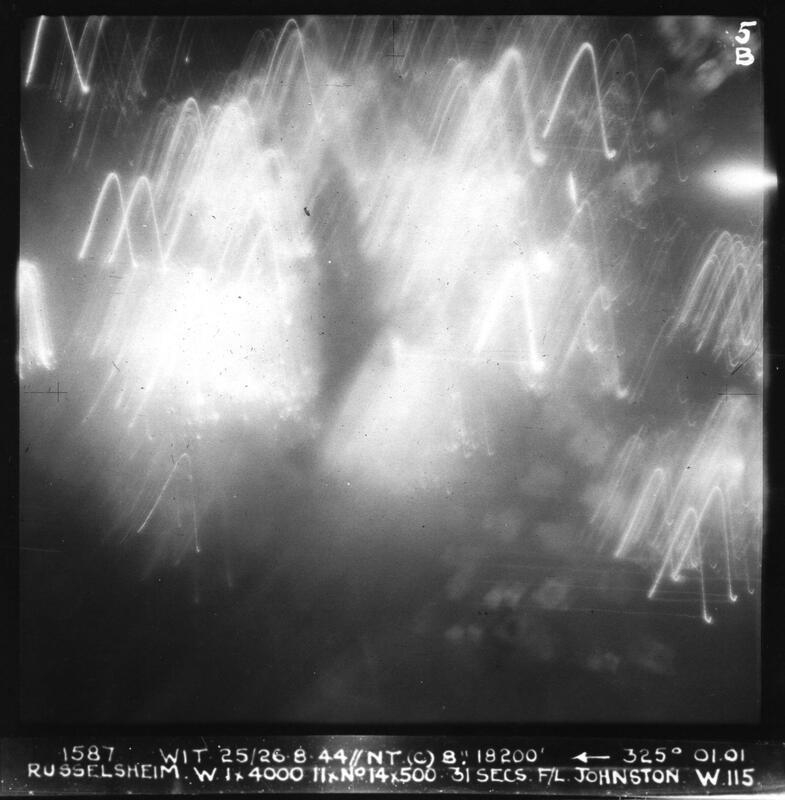 Bags of flak and several hundred (at least) searchlights. One fellow got a direct hit by flak on the run up about a mile behind us – enormous explosion – while a fighter got another just north of the target. There were seventeen chops altogether – we lost Alldridge. When we were about a hundred miles from the target on the way in Dave saw a fighter (a Ju88) but it didn’t see us and passed off to starboard. About halfway back over England we were diverted to Woolfox Lodge which we found after a bit of trouble and were on the approach when they in turn diverted us to Methwold. Methwold has undoubtedly the worst landing procedure of any I’ve seen – I had to overshoot three times! Due to the way they handled us. Finally landed OK then after a meal sat and slept in chairs for a few hours – flew back here at nine. Overshot again here (making five times in one trip!). Trip was eight and a half or more hours.